If I was lucky enough to have met Michael Powell and hear first hand that his favourite P & P movie was A Matter of Life and Death, then confirmation of his creative partner's choice (The Life and Death of Colonel Blimp) comes from the accompanying documentary on the disc and is also contained in the pages of part one of Powell's autobiography, 'A Life In Movies'. It's not a surprising choice given that Pressburger was an enthusiastic anglophile. The German character (Theo Kretschmar-Schuldorff played by the incomparable Anton Walbrook) is welcomed into the UK during the middle of the second world war despite his soldiering against the UK throughout his long career. Pressburger must have revelled in writing this extraordinarily moving scene (Theo's wife had died and his children became Nazis so with nothing in Germany to keep him there, he sought refuge in the UK). You wonder if Pressburger was taken into to his beloved country in the same manner as his fictitious German character. Blimp is a movie that encompasses many huge themes and is a work that is not only ahead of its time, its panache and élan is markedly ahead of many film-making styles even being practised now, over sixty years later. In fact, looking at the broader picture, Blimp is to modern cinema, as General Wynne-Candy (Blimp's movie identity) is to the whippersnapper soldiers who regard the old guard as old codgers, out of touch OAPs who have nothing more to offer. The fact that Blimp is actually about many important themes and modern cinema is about lightning flashes which very occasionally strike and illuminate a subject of weight almost by accident, is another aspect that underlines Blimp as a profound treatise on being human. People grow old. They have opinions. Sometimes those opinions change. Sometimes they don't. Being a German doesn't make anyone a Nazi. Friendships between individuals can flourish while their countries try to annihilate each other. Youngsters cannot imagine what it is like to be encased in an older body whereas the sadness is that the reverse is never true. 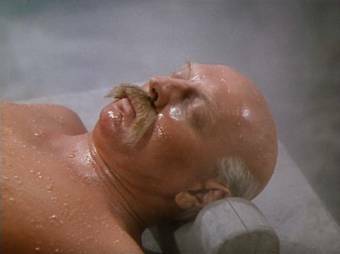 Colonel Clive Wynne-Candy is an old soldier lounging is a steam bath. He is assaulted by brash, impudent soldiers who have deliberately taken the directive that 'war starts at midnight' and decided to play as dirty as the enemy they are fighting. Nazis would not observe rules so these men assume that's the way to win a war against Nazis (I have to admit, the logic works for me) and within ten minutes of screen time, the young commander is standing in front of the old Clive as he sweats, making fun of the heavier, older man. Big mistake. In one of the cinema's smartest flashback transitions (in one take, mind you), the older Clive dives in to the pool to beat some sense into the young commander and as the camera passes over the pool, we see the young, dashing Clive step out the other end. It's now 1902. It's one of those shots that makes you link the term film-maker with artist with no hesitation. Clive Candy is vibrant and brash with youthful vigour (Livesey was 37 at the time and straddles the demands of a role that take him from his late twenties to his early sixties with great aplomb). I am also thrilled to mention that Roger Livesey – like myself – was a Welshman born not far from where I was, in Barry, South Wales. That accent is very far from Welsh.... We learn quickly that Clive Wynne-Candy has a strong sense of morality and has already won a Victoria Cross. To maintain a positive spin on how England is perceived, Clive travels to Berlin to help an English teacher, Edith, to staunch damaging propaganda. After a wonderful scene in a Berlin restaurant, Candy gets himself into a duel with a fellow soldier fighting to satisfy the German army's honour. Recovering from their wounds, the German, Theo, and Clive become firm friends and Theo and Edith fall in love. It's in these scenes where the unfussy Roger Livesey comes into his own (aided by a superb screenplay of course). Theo asks for a second duel believing that Clive and Edith are romantically linked. He has fallen in love with her and Clive, in shock, stands on his bed and looks down at his friend. "You're cuckoo!" he says (this in itself is a terrific reverse as it's really Clive who's the cuckoo, or cuckold because he really is in love with Edith too but he's too bloody English to know it yet. Livesey's acting here is exemplary). But then he breaks into a grin, steps off the bed and warmly congratulates his friend. He seems to be OK until he moves in to kiss Edith. As he moves away we see that Clive knows he has just kissed goodbye any chance of romantic fulfilment. He is utterly in love and he's just given away his sweetheart to his best friend. His sense of self-deception locks in but he cannot get Edith out of his mind and throughout the next forty years, he finds women who resemble Edith a great deal (casting wise, this is not surprising as they are all played with a prim undercurrent of refined sexuality by Deborah Kerr). When Clive learns that Theo's been taken prisoner, he performs a lovely bit of what actors call 'business'. "Poor old Theo," he says and he strokes underneath his moustache which of course was grown to hide his huge scar from a clean cut given to him by Theo. It's subtle but it's tremendously affecting. Pressburger may have reminded Powell that cinema is not words but repeated exposure to Blimp means that words that may have sailed over your head at the first viewings now makes your jaw drop with the humour, the signposting and the love of the language. Two examples of this; the best friends have had their duel and both been handsomely cut by each other's swords. They are nursed by the woman whom Clive falls in love with but who eventually leaves in love with Theo. Convalescence is dull so the friends play Bridge endlessly. At the start of their games, Candy shuffles the cards and says (and it still makes me smile with the brilliance of it) "Cut for partners?" Sublime. Secondly, with the use of three words five minutes apart, Pressburger demonstrates the art of economy, a screenwriter's principal weapon. In the middle of the First World War, Clive, still in love with Edith, is offered macaroni. "Beastly stuff!" he comments preferring to visit the local convent to find better food. Minutes inside the convent, Clive encounters the woman he will marry, a nurse the spitting image of Edith. He is then offered macaroni again and Clive offhandedly says "Splendid!" That's how to write screenplays, folks. These are merely two instances that convince me even more that Pressburger's skill as a screenwriter was off the chart. He seemed to know what Powell could do with his words, how those elusive emotional attachments could form. It's a creative form of prescience because most film-makers have no clue what emotional effect their film is going to have on an audience but Pressburger's command of his words and faith in a director so suited to his partnership seems to grasp what's possible. At the end of the film, Clive acknowledges that new methods of warfare are necessary after being caught with his trousers down in a war game, one which neatly bookends Blimp. He is distraught at his uselessness but then with wisdom, he swallows his pride and agrees to invite the young impudent soldier to dinner. There is a wonderfully moving but simple pan from Clive's driver 'Johnny' (another Edith clone) to Theo and to Clive, who finally accepts the new world in with a resounding salute. How this could be moving eliciting real warmth from this particular audience I will never know. But P & P do. And it's a consistently revealing joy to experience. One trivial aside: Clive Candy heads the Home Guard at the end of Blimp and his batman and housekeeper is played by John Laurie. Shortly before the Blitz, Laurie announces he has joined the Home Guard. It's a lovely nod to the actor (more prescience by Emeric & Mickey?) as Laurie goes on to become famous as Private Fraser the home guard undertaker in Dads' Army. As with the other two Technicolor classics, the sound is clear with no showy effects from the mono to Dolby Digital transfer. The picture quality is very good (although someone please introduce P & P to drop shadow for their credits) with extraordinarily few sparkles and hardly any evidence of negative dirt. This DVD is essentially the same pressing as the 2000 released DVD but that one was terrific too. This time, we get a few extras. Side Note: In direct comparison with the Criterion Collection DVD of Blimp (a DVD that slaughters the HMV release in the areas of Extras – a Scorsese and Michael Powell commentary? Wow!) I have an interesting fact to report. The Criterion version proclaims a transfer from the original full-length version held by the British Film Institute. Something must have slipped by because directly comparing the two versions, the Criterion does have a slight pink overall tinge. It's very noticeable when screened side by side and in light of Criterion's usually high standards, this came as a bit of a blow. A 'Ken Burns Effect' trawl though a series of promotional stills (frankly not that sharp) in B&W and colour. Nice to see the promotional material featured. With no title and called simply 'Documentary', this is a retrospective from relatives' points of view and nice to see fan Stephen Fry chipping in. 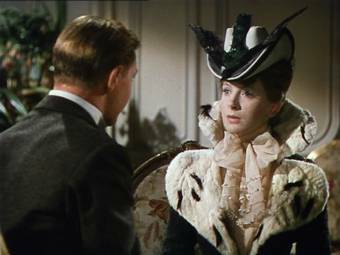 It also gives a political context for the film with offerings from P & P champion, Ian Christie (the champion of P & P and author of the sumptuous volume on P & P, Arrows of Desire). Again, if you enjoyed the movie, this is a perfect dessert. The only downside of these stand alone retrospectives is their liberal use of clips. Once you've just seen the movie, you really don't need the clips. A small gripe.